If you really want to bring amazing biceps, triceps and shoulders to the 'gun show' then try this circuit of 9 exercises to see explosive arm muscle growth! Learn about each exercise, reps, sets and intensity below! Every guy wants to have big muscular arms; and most girls love it when guys do. But, in this fast paced life, internets and all, how does one achieve such a feat? For most of us, our schedules do not lend a helping hand. You see sometimes, the clock will not spot us! If you have achieved a decent level of fitness and the only thing left is the ticket to the gun show, this workout will shred your arms for the big preview. Now most of you have no clue who I am, which I could say you are missing out, but how cliche, I am a former NFL free-agent, personal trainer, and career guy that loves to stay in shape. Throughout my athletic career, training, and personal conquest to gain muscle mass, I have found a few ways to increase gains on my arms. I say that I have found ways because when I tried to gain mass it was not happening for me. workout will shred your arms for the big preview. My workout consists of 3 to 4 days of lifting and 2, but more often than not, 3 days of cardio. I am 30 years old but I eat well and stay in good shape. I did not always understand how to take care of my body, mind, and soul for years, but thankfully I have in the past few years. My hair seems to be failing me at the moment, but I put a lot of miles on my brain these days so I look at the top of my head is like a well driven road. I have a great job, a wonderful fiance, and I work from 7:00 a.m. to 5:00 p.m. but after that, that is when my fun begins. I am a gym rat through and through, I am obsessed with being in a gym, and I will admit I even enjoy the smell. I started out lifting the typical isometric exercises for years, lifting 3 sets of 10 reps on just about everything I did. My break-through was once I finished college; I received my Exercise Physiology degree, and paid attention in the weight room during strength training. The best thing I figured out in that time period was 'tricking' my muscles and body to do what I wanted. I was like a sneaky, deceiving man, lying here and there, doing things that only a crazy person would do, but it worked. I was the guy in the gym that you look at and wonder what the 'H' is wrong with that person and what kind of workout is that. I have said that to myself, quickly realizing people say that about me. and soul for years, but thankfully I have in the past few years. Being a somewhat attention deficient guy, I had to figure out a way to stay motivated and enjoy my workouts, while adding muscle. My routine was a full body workout that ended up giving me some big arms even though I was trying to tone up. The first time I really realized that my arms were getting bigger is when I reached to the back of the closet and grabbed a shirt I had not worn in a few months. I put said shirt on and got the 'what the...' look from my fiance. So I looked in the mirror and needless to say I was a man-child. It felt good and made me feel accomplished, and we had a good laugh. Lie on the floor face down and place your hands about shoulder width apart from each other holding your torso up at arm's length. Place your feet on top of an exercise ball. This will allow your body to be elevated. Lower yourself until your chest almost touches the floor as you inhale. Press your upper body back up to the starting position and squeeze your chest. Breathe out as you perform this step. After a second pause at the contracted position, repeat the movement for 3 sets of 12 repetitions. Try to do as many as you can plus one extra rep each of the 3 sets. 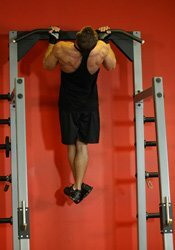 Pull ups are much better for you than the lat machine. This will help build those lats and your biceps. Pretty self explanatory. Start with dumbbells palms forward, curl dumbbell to shoulder, press up overhead for shoulder press movement. Return to starting position, do 10 reps and 3 sets. Place a kettlebell on the floor. 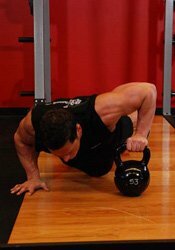 Place yourself in a pushup position, on your toes with one hand on the ground and one hand holding the kettlebell, with your elbows extended. This will be your starting position. Begin by lowering yourself as low as you can, keeping your back straight. Quickly and forcefully reverse direction, pushing yourself up to the other side of the kettlebell, switching hands as you do so. Go back and forth each side until you do 12 reps. Do this 3 times. Stand erect while holding a barbell with a supinated grip (palms facing up). Bend your knees slightly and bring your torso forward, by bending at the hips, while keeping the back straight until it is almost parallel to the floor. This is your starting position. While keeping the torso stationary, lift the barbell as you breathe out, keeping the elbows close to the body. On the top contracted position, squeeze the back muscles and hold for a second. Return to starting position and repeat movement 10 reps for 3 sets. Hold a barbell with an overhand grip (palms down) that is a little closer together than shoulder width. Lie back on an incline bench set at any angle between 45-75-degrees. Bring the bar overhead with your arms extended and elbows in. The arms should be in line with the torso above the head. This will be your starting position. Now lower the bar in a semicircular motion behind your head until your forearms touch your biceps. Inhale as you perform this movement. Go slow and careful, this will burn the triceps. Do 8-10 reps for 3 sets. Clean two kettlebells to your shoulders. 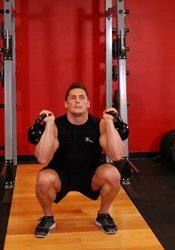 Begin to squat by flexing your hips and knees, lowering your hips between your legs. Maintain an upright, straight back as you descend as low as you can. At the bottom, reverse direction and squat by extending your knees and hips, driving through your heels. As you do so, press both kettlebells overhead by extending your arms straight up, using the momentum from the squat to help drive the weights upward. As you begin the next repetition, return the weights to the shoulders. Do 12 reps for 3sets. Starting in stand position in the cable column, grab the left cable with your right hand and the right cable with your left hand. Do a lateral raise with a bent elbow just shy of shoulder height. Do 10 reps for 3 sets. Lay flat on the floor with your arms next to your sides. Now bend your knees and lift your feet off the floor by around 2 inches. Using your lower abs, bring your knees in towards you as you maintain the bend in your legs. Continue this movement until you raise your hips off of the floor by rolling your pelvis backward. Breathe out as you perform this portion of the movement. Tip: At the end of the movement your knees will be over your chest. Squeeze your abs at the top of the movement for a second and then return to the starting position slowly as you breathe in. Do 10 reps for 4 sets. I do this workout every other time I lift. I alternate it with a lower body based circuit. I feel it is important to trick your body into doing what you want it to do. The way you do this is to change up your workout and change resistance. I will tweak this workout after 4-6 weeks. I have 3 circuits and 1 standard weight lifting routine that take turns being my method of gym madness. I cycle these supplements 4-6 weeks with my circuit. I will go off all supplements for 4-6 weeks at a time. I take my vitamins daily because Hulk Hogan told me to, kidding obviously, but I do take the multivitamin and Vitamin C daily. This is what has worked for me; I hope this will work as well for you. Remember to push yourself with each workout, breathe with each rep, and listen to your body. Be safe.